Symantec may have felt the strain of declining license sales in its fourth quarter, but it believes it can turn this trend to its favor. MOUNTAIN VIEW, Calif. ( TheStreet -- Symantec ( SYMC - Get Report) sufffered declining license sales in its fourth quarter, but Chief Financial Officer James Beer believes it can turn the trend to its favor. The software maker noted a year-over-year decline in its license sales as more customers opted for subscription-based offerings. The shift, it said, caused fourth-quarter revenue and earnings to duck below its expectations. 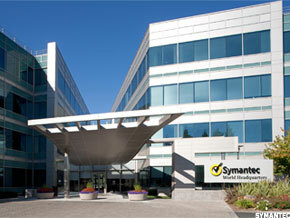 Symantec reported fourth-quarter results on Wednesday. "In the fourth quarter I would say that that trend developed a bit quicker than we expected relative to the overall software business," explained Symantec's Beer, in an interview with TheStreet. "We're very much working with that trend when you look at the new offerings that we're putting in the marketplace." Symantec, he added, will continue to develop its core license-based business, but will put more effort into increasingly popular cloud-based subscription services. The CFO pointed, for example, to Symantec's O3 technology, which lets enterprises manage their employees' access to cloud services. "For an enterprise, tapping into a hosted service avoids the need to build the infrastructure in your IT department," he said. "As both enterprises and consumers are looking to become more mobile, it's easier to be tapping into the Internet than it is loading the software onto your desktop or mobile." TBR analyst Allan Krans predicted a busy few months for Symantec as the company looks to put the fourth quarter behind it. "To regain its stability through the remainder of 2012 and beyond, Symantec will focus product deployments on extending core capabilities across cloud, virtualization and mobility to capture customers," he explained, in a note released on Wednesday. In particular, the analyst expects Symantec to tap its recently extended partnership with virtualization heavyweight VMware ( VMW - Get Report), as well its recent acquisitions of mobile device management specialists Nukona and Odyssey Software. "The acquisitions position Symantec to capitalize on the pain felt by IT departments to effectively manage and secure information," explained Krans. "The extension of Symantec's core management and security capabilities in the mobility market will help stimulate positive growth across these portfolios." Symantec, which recently released its preliminary fourth-quarter numbers, reported revenue of $1.68 billion on Wednesday, flat year over year. The company's earnings were 38 cents a share, equal to the prior year's quarter. Previously, the software maker had projected sales of $1.72 billion to $1.73 billion and earnings of 41 cents to 42 cents a share. Despite declining fourth-quarter license sales, Beer noted that Symantec's revenue climbed 9% year over-year to $6.73 billion in fiscal 2012, while earnings increased 13% to $1.61 a share. Both numbers were in line with analysts' estimates. "We were actually pleased with the overall company performance," he told TheStreet. Symantec, however, is now in the "investor penalty box" until it convinces investors that its March quarter was just a hiccup, according to FBR Capital Markets analyst Daniel Ives. Ives lowered his Symantec price target from $21 to $20, after trimming his first-quarter estimates for the company. The analyst, however, maintained his outperform rating on the company in a note released on Thursday. "We continue to stay the course on the Symantec story as we believe the company is slowly moving in the right direction with improving underlying trends in its core security markets, coupled with a product cycle on the storage front that should help catalyze growth during the course of fiscal year 2013," he explained. For the first quarter, Symantec said it expects revenue between $1.645 billion and $1.66 billion, and earnings between 37 cents and 38 cents a share, compared to Wall Street's sales forecast of $1.66 billion and earnings of 42 cents a share.